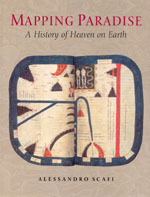 The first book to show how paradise has been expressed in cartographic form throughout two millennia, Mapping Paradise explores the intellectual conditions that made the medieval mapping of paradise possible and the challenge for mapmakers to make visible a place that was geographically inaccessible and yet real, remote in time and yet still the scene of an essential episode of the history of salvation. A history of the cartography of paradise that journeys from the beginning of Christianity to the present day, Mapping Paradise reveals how the most deeply reflective thoughts about the ultimate destiny of all human life have been molded—and remolded—generation by generation. Read the press release. . . .
David Boaz, executive vice-president of the Cato Institute, has a blog entry about Deirdre McCloskey’s book, The Bourgeois Virtues, in the Guardian‘s “collective group blog,” Comment is Free. 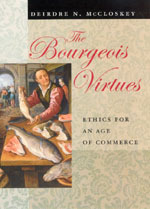 “Since the beginning of bourgeois society,” says Boaz, “the vocabulary of virtues has been used to berate and denounce capitalism.” It’s time to “take the word ‘bourgeois’ back from its enemies, to make it a term of honor.” The Cato Policy Report published an article by McCloskey that summarizes the aims of her book. You may also read an excerpt from the book. . . . The July 20 edition of the London Review of Books has a review by Jeremy Waldron of a recent book by John Durham Peters, Courting the Abyss: Free Speech and the Liberal Tradition. Waldron notes: “Courting the Abyss is about free speech generally, but it focuses on this suggestion that we all become better people through tolerating the most hateful and diabolical speech, by staring at and listening to the Nazis and the racists in our midst.” Though Waldron—a law school professor—wishes for a book that is more analytical and less literary—Peters’s discipline is communication studies—Waldron’s engaging review nonetheless allows that the book is “interesting and provocative.” An excerpt will acquaint you with both the literary and provocative nature of the book. . . . The Bourgeois Virtues argues that capitalism is good for us, that markets improve ethics, that free enterprise makes us better people, and that bourgeois virtues isn’t an oxymoron along the lines of military intelligence or Microsoft Works. Countering centuries of pat assumptions and unexamined thinking here, Deirdre McCloskey takes dead aim at critics who have argued for nearly a millennium and a half that capitalism is responsible for everything from financial and moral poverty to world wars and spiritual desuetude. Read the press release. Read an excerpt from the book. . . . The story of the kamizake or tokkōtai is among the most tragic and misunderstood in the history of World War II. Commonly remembered as suicide pilots who volunteered to die for their country, a significantly large number of these student soldiers were in fact gentle souls who were forced into their desperate mission. 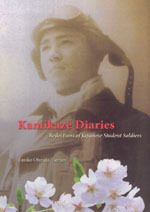 Fortunately, some of the kamizake also wrote diaries, and six of them are collected here in this heartbreaking but much needed corrective to their many caricatures. Read the press release. Read an excerpt from the book. . . .
Yesterday’s Chicago Tribune carried a review by Lois Wille of Timothy J. Gilfoyle’s Millennium Park: Creating a Chicago Landmark. Wille pronounces the book “fascinating and gorgeous,” but also makes clear that the book is more than just pretty pictures. Wille, who has made significant contributions of her own to the history of Chicago’s lakefront, pays particular attention to Gilfoyle’s account of the political and philanthropic machinations necessary to create Millennium Park. Gilfoyle, says Wille, “has wise things to say about Millennium Park’s lessons for the economic health of Chicago and other postindustrial cities with global aspirations.” We have a Millennium Park trivia quiz. . . . In the extraordinary spirit of vision and ambition that characterized the Columbian Exposition of 1893, where new and exciting innovations in art, architecture, and urban design were so dramatically unveiled on a world stage, Millennium Park opened in downtown Chicago two years ago. Featuring now iconic works by Frank Gehry, Anish Kapoor, Jaume Plensa, and Kathryn Gustafson, the park was promptly hailed in newspapers and magazines across the country as an incomparable global tourist destination and a crowning achievement for the city of Chicago. 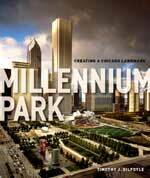 With more than 500 images (and most in color), this beautifully illustrated book tells the story of how Millennium Park came to be. Read the press release. You may also take our trivia quiz. . . .
Today is the 400th birthday of Rembrandt van Rijn. The master of light was born July 15, 1606, in Leiden. When he was twenty-five he moved to Amsterdam, where he lived the remainder of his sixty-three years. A book by Steven Nadler, Rembrandt’s Jews, examines the artist’s life and work in the Jewish Quarter of Amsterdam and the depiction of Jews in his art. You can read an excerpt from Nadler’s book. Rembrandt’s Late Religious Portraits by Arthur K. Wheelock looks at Rembrandt’s brooding half-length portraits of religious figures from the late 1650s and early 1660s. We published the book last year in conjunction with an exhibit at the National Gallery of Art. From our deeper backlist comes Rembrandt’s Enterprise: The Studio and the Market by Svetlana Alpers, who examined Rembrandt’s appeal to the buyers of his art and his market strategies. Many more books about Rembrandt are available from publishers we distribute. Museums around the world have special events and exhibits marking the quadricentennial. Find an exhibition of Rembrandt’s work near you. . . .
Pat Kane reviewed Richard Lanham’s The Economics of Attention: Style and Substance in the Age of Information in the Independent today. 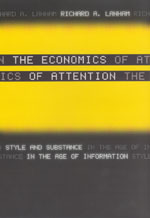 “If there’s one thing the internet has not brought about, contrary to all prediction,” says Kane, “it’s the destruction of literature.” The book springboards from the insight that “our true scarcity is attention, not culture.” Lanham “is as deeply immersed in arts and letters as he is in bytes and chips” and “his welcoming attitude towards electronic media comes from his long perspective.” Kane notes that “it’s refreshing to read a deeply literary mind who embraces the information age, and wants to focus on its civilising possibilities rather than flee from the screens in horror.” We also have an interview with Lanham and an excerpt from the book. . . . The weather forecast for the Chicago area for this weekend is hot and humid, with the Sunday afternoon heat index expected to approach 110°. The National Weather Service has issued a heat advisory for Sunday afternoon through Tuesday evening, noting that the heat may extend into Wednesday and Thursday. All of which reminds us of this same period eleven years ago—July 13-20, 1995—when over seven hundred people died in Chicago over a week of intense temperatures—with an inadequate public response contributing to the high fatality rates. Eric Klinenberg wrote the definitive book on the event and its causes, Heat Wave: A Social Autopsy of Disaster in Chicago. When the book was published we did an interview with Klinenberg, which still makes instructive reading. Keep cool this weekend. Go to the library. Go to the beach. See a movie. . . .